In a self-service environment with multiple publishers, it’s common for a project on Tableau Online to contain a variety of data sources that are named similarly, or are based on the same or similar underlying data, or are published without any descriptive information about them. When this is the case, analysts who create views in Tableau Desktop or web authoring can’t be confident knowing which data source is the right one to connect to. To help your users find the data that’s trusted and recommended for their type of analysis, you can certify the data sources that comply with your organization’s data standards. When you certify a data source, its icon in the list view, or thumbnail in the grid view shows a green check mark. This appears anywhere the data source is shown, including when connecting to data in web authoring or from Tableau Desktop. Certified data sources rank higher in search results and are added to recommended data sources. In addition, you can provide notes about the certification status, which appear in a tooltip when users hover over the data source icon or card. 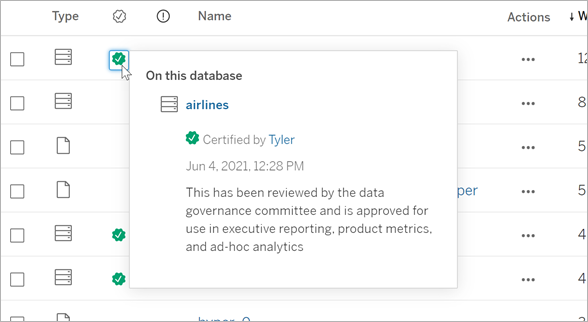 The tooltip in list view also shows who certified the data source and the data source’s connection type. For more information, see the Certify a data source steps below. As with most Tableau functionality, certification is flexible. You can define for your organization the criteria you use to determine when to certify a data source. As you do this, you might want to document and share your guidelines. As new data sources are published, the guidelines can help you and other administrators or project leaders to be consistent with your certification choices. They can also help users understand what certification means. Whether you use the same certification criteria across all projects, or define unique criteria for each project, the important thing is to be clear about what certification means in your environment. Creator site role with the Project Leader permissions role on the project that contains the data sources. Sign in to Tableau Online and under Explore, select Data Sources. On the Data Sources page, select the data source to expose its information, and then select the Details tab. Select the This data is certified check box. Add a note that gives users context for the certification status, intended use for the data, or other helpful information. 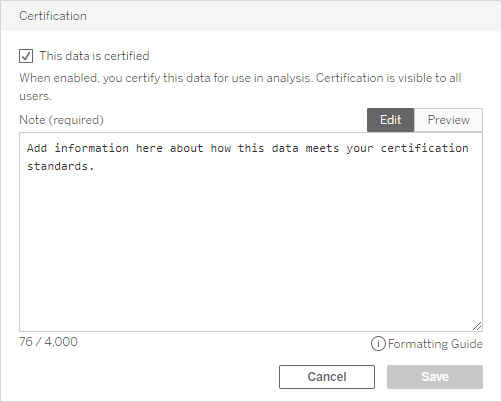 Information you add to the Note section appears in the certification badge tooltip, mentioned earlier in How certification helps users find trusted data.